Saint-Malo (French pronunciation: [sɛ̃.ma.lo]; Gallo : Saent-Malô; Breton: Sant-Maloù) is a walled port city in Brittany in northwestern France on the English Channel. It is a sub-prefecture of the Ille-et-Vilaine. I left Pouzages at 7am yesterday morning with the aim of putting in a big day. No big lunches, no relaxing coffee beaks, just head down and see how far I could travel. The temperature was 3C, according to a sign on the side of a commercial building but with the NNE wind still blowing it felt even colder. The countryside looked like Wiltshire, but the cows are different. The crank continued to squeal in pain, but at least when it was squealing I knew that things were still tightly connected. It was when the squealing stopped and the clunking began that I knew things were falling apart. That happened just once during the day buy by now I was able to tighten everything up petty quickly. Parts of the ride were once again along long, undulating Roman roads, some sections through forests. Because I was in a bit of a hurry, I was grabbing food at shops along the way. My diet was a disgrace – Danish pastries, croissants, energy drinks, chocolate bars and even Liquorice Allsorts (although I think the French version is called something else). The ride took me over the Loire. In the past couple of days I had already traversed the Garonne, Dordogne and Charente rivers, as well as a host of minor ones, so if there’s ever a pub quiz question about naming major French rivers from south to north, I could be in the money. If the question’s about north to south, that would be tougher. The Loire crossing was by far the most picturesque with wide sandy beaches lining the banks as I cycled across an attractive suspension bridge at Ingrandes. The sun was shining, the terrain was reasonably flat, yet sheltered somehow from the worst of the wind, and I made good progress. The area just north of Ingrandes in the Loire valley provided some of the best cycling of the trip. I had numbered my map sections for France from 2 to 13. Number 1 would have been Spain, but I hadn’t had a Spanish version of the Michelin maps I was using. I don’t think these exist. When folded to fit into the little plastic pocket on my handlebar bag, the depth of the map, as I traveled almost due north, represented about 18 miles, an hour and a half at my average speed of 12 mph. The towns, on average, seemed to be about 12 miles apart, so I was beginning to judge my likely progress for the day on this basis. As I set out yesterday morning, catching today’s ferry seemed a possible but rather challenging target. However, I knew that it would be a good time to cross back into the UK because most people visiting France for the Easter weekend would travel back on Easter Monday. For this reason I had decided to go for the greatest possible distance yesterday, timing the trip to end up in a feasibly large town where I would almost certainly have no problem finding a hotel. At 135 miles for the day and 8:35 in the evening, that town was St-Aubin-d’Aubigne. I walked casually into a bar and asked for directions to the nearest hotel. In a repeat of the previous evening’s response, my request was greeted with a shrug of the shoulders and open palms. The husband and wife owners of the bar then dug out their equivalent of ‘Yellow Pages’ and made some phone calls. By 9pm they had reserved me a room in what turned out to be a lovely Auberge in the centre of the town of Sens-de-Betagne. I headed out of St-Aubin-d’Aubigne on a major road, part of which was a mile long section of dual carriageway. It was getting dark, still windy, and then the clouds that had gradually become more threatening throughout the afternoon became precipitous and I had to pull over and don the waterproof trousers and overshoes once more. When I arrived at the Auberge La Tourelle about 45 minutes later, the restaurant was very busy but I received a warm welcome and sat down to a very good dinner at 10pm. A bit late, but I had to wash down the Liquorice Allsorts with something! 4am start this morning, in the dark with the odd rain shower, but arrived in St Malo at 7:40, seven days, almost to the minute, after setting out from Barcelona. I upgraded to a Commodore cabin on the ferry for about £85 and looked forward to an enforced rest after 790 miles in the saddle. 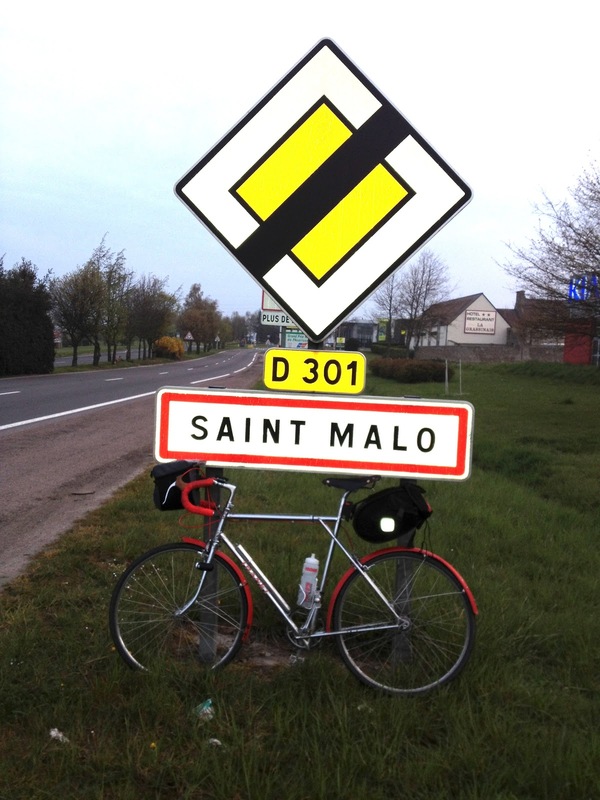 After 790 miles in 7 days and 10 minutes, I arrived in Saint-Malo. Feeling great – just another 100 or so to go tomorrow but think I could be getting wet!